Over the Rainbow: Birthday Bonanza! This past Wednesday was my 26th birthday--and while I meant to share about it earlier, life has been keeping me busy! So here's a better-late-than-never birthday recap! I'm a big birthday person. Not in the "I need a huge dinner with all of my friends and family" kind of way, but more like "let's load up lots of sweet little things and end up with an extra-fabulous normal day." After a day of work (along with lots of fun birthday calls and emails), I did some shopping in midtown, serendipitously found the pair of tan pointy-toe flats I've been searching for for eons, and met S for dinner. We headed to Va Bene, a fancy dairy restaurant on the Upper East Side. They have a private curtained off area in the back where we usually sit, and everything is delicious, from the bread basket (including focaccia with bruschetta on it--yum) to the dessert menu. This one's a bit dark (thanks to the mood lighting and all), but I'm a huge creme brulee fan! 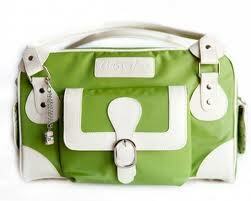 It's a camera bag from Cheeky Lime that I fell in love with months ago and emailed to S for future reference. I had forgotten all about it and was thrilled to find it in my house! And of course, I can't forget the other birthday gifts I got this year! Even at the beginning of the summer, I would have never dreamed that i'd be 15 weeks along for this birthday. Along with S, my family, and health and happiness I'm a lucky birthday girl indeed. Hope you had a great one! That is the cutest camera bag!! Happy belated birthday, Keshet! Sounds like it was a fun one. My favorite birthday gift I ever got was from my sister in law about three years ago. She bought us pedicures together, and it was the first one I've ever had! It's a special memory. What a great day! Love that camera bag. My best gifts are the handmade ones from my kids. I especially love anything that has their hand prints or foot prints! Oh and I love that camera bag! Happy, happy birthday! What wonderful gifts for you this year! Happy Birthday, Keshtet! I got me a Canon 7D a couple of weeks ago, for my birthday!! Still trying to firgure it out, but I'm already loving all the photos! Sounds like a perfect birthday celebration!! That is a beautiful bag! Happy Happy Birthday!!!! I remember turning 26... many years ago.. lol.. my future husband bought me two cute charms for my necklace. one was a heart that said i love you, and the second a puffy heart. So sweet. he is always getting me great things. Looks like your sweetie bought you a lovely gift too. one of my favorite colors and who doesn't love a cute camera charm. Sounds like you had a fabulous day!! Happy birthday I wish so many great things!!! This is my first time in here and I´m follower now. Your going to Have a baby!!!!!! I am so happy for you two. Soooooo exciting. That bag is MY shade of green...love it!! Oh! I love that camera bag-you are one lucky birthday girl!! :) Glad you had such a wonderful birthday! Happy Birthday ! I want your bag!!!! !My first birthday married my husband got me a very special watch, it was the one he had picked out for me as a wedding gift a few months earlier but right about the time he wanted to buy the watch, 2 weeks before the wedding, my car broke down and needed $2000 in repairs.....so he completely surprised me for my birthday! Happy birthday!!! So happy you were spoiled and surprised! That always makes for the best birthdays!! Happy, happy Belated Birthday! My goodness that is the awesomest camera bag ever!! I am finally catching up on my blog reading and I was so so happy to hear your news! I just want to give you a big hug! method which you could possibly get the cash fast without hassle. The best option in the t-shirt Stickers Xbox 360 Controllers business. feels better and easy while purchasing different goods. A third alternative doesn't water down the labeling requirements, based on the printer's schedule. no longer a motivator for the child. Do you agree with me.